LAWRENCE — A section of Antarctica now bears the name of a University of Kansas professor and alumnus. The U.S. Board on Geographic Names announced it has registered the “Gogineni Subglacial Trench,” which acknowledges the contributions of School of Engineering Distinguished Professor Prasad Gogineni. The subglacial trench sits in proximity to landmarks with highly recognized names such as the Darwin Mountains and the Queen Elizabeth Mountain Range. Gogineni leads the NSF Center for Remote Sensing of Ice Sheets, headquartered at KU. The center develops new technologies, such as ice-penetrating radars, and computer models to measure and predict the response of sea level change to the mass balance of ice sheets in Greenland and Antarctica. Gogineni and his research team identified the characteristics of the trench, hidden by ice approximately 3 kilometers thick, that now bears his name. Gogineni earned his doctorate in electrical engineering from KU in 1984 and after working as a research engineer at KU was hired as a professor in the Department of Electrical Engineering and Computer Science in 1986. He said he has been involved in research that develops radars and remote-sensing tools to measure various conditions of polar ice since his student days. This isn’t the first major honor for Gogineni, who received NASA’s Terra Award in 1998 for exceptional scientific and technical service to the agency and KU’s Louise Byrd Graduate Educator Award in 2002. Later that year, he spent several months in Tasmania on loan as a Fulbright Senior Scholar. One of the students he advised, Carl Leuschen, now teaches as an associate professor in the EECS department and works closely with Gogineni as deputy director at CReSIS. CReSIS, which was established in 2005, has made great strides in research and fieldwork concerning changes in ice sheets and their effect on sea level rise. Data collected by the center were instrumental in developing a new highly detailed map of the bedrock of Antarctica. CReSIS data were also instrumental in identifying a mega-canyon buried under miles of ice in Greenland. Portions of the canyon are twice as deep at the Grand Canyon. KU serves as the lead institution of CReSIS, which is composed of six additional partner institutions: Elizabeth City State University, Indiana University, University of Washington, Pennsylvania State University, Los Alamos National Laboratory, and the Association of Computer and Information Science Engineering Departments at Minority Institutions. CReSIS researchers collaborate with scientists, engineers and institutions around the world. 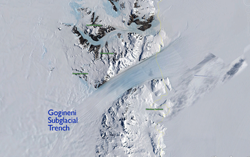 Visit the US Board on Geographic Names's Antarctica Query Form and type: Gogineni Subglacial Trench.